This is the first full definitive monograph on one of the most unique of Irish monuments, the Round Tower, detailing the story of the one at Roscrea from its historical background, through its erection in the twelfth century down to the present day. 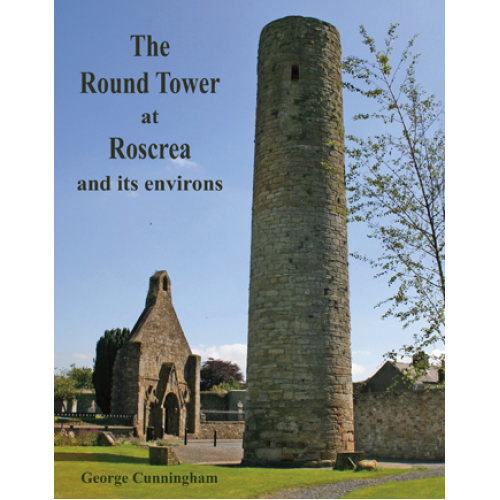 Published by Parkmore Press, Roscrea in full colour throughout, quarto size (210x270mm), 296 pages. Laurence Walsh ocso contributes the preface and also has an appendix on the Roscrea Ship unravelling a mystery that has puzzled all to date. John Feehan has written a short but exquisite foreword. The book contains over 350 illustrations, mostly colour: antiquarian images and prints, photographs, maps, cartoons and commissioned drawings, many published for the first time. The first chapter contains an overview of the Irish Round Tower. Chapter five illustrates and discusses the Round Towers of the south Irish midlands, again with antiquarian images. Two early chapters deal with the historic early Christian background of Monaincha and St Cronan’s Roscrea and the treasures therefrom, such as the Book of Dimma and its shrine, The Roscrea Brooch, the Annals of Roscrea and the Rule of Eachtgus Ua Chuanáin. These early chapters have been read and commented on by the leading scholars of this period – scholars like Peter Harbison, Dáibhí Ó Cróinín, Pádraig Ó Riain, Roger Stalley, Dan McCarthy, Edel Bhreathnach, Elizabeth O’Brien and Con Manning - so that the text reflects the latest and best in Irish scholarship.